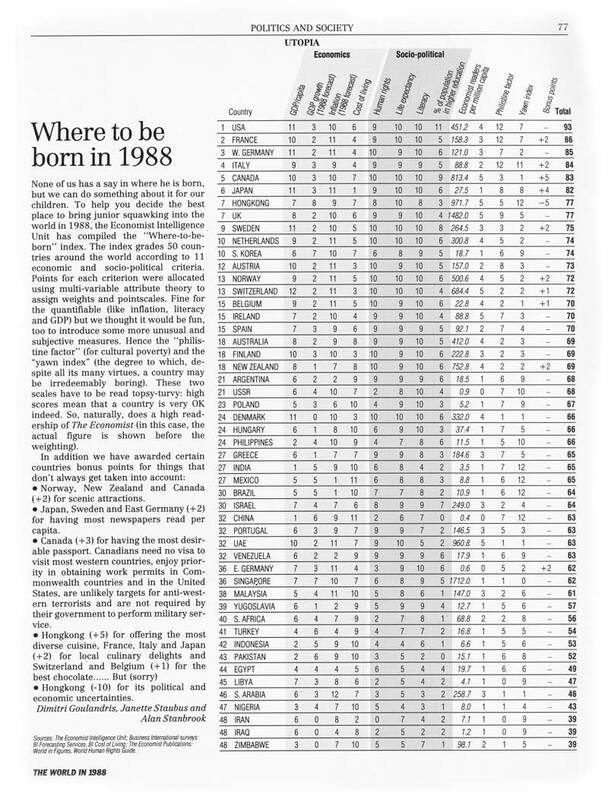 A View From The Cave: Where is the best place to be born in 2013? According to the latest index from The Economist the answer is Switzerland followed by Australia, Norway, Sweden and Denmark. For those of you looking for the United States (16) and Britain (27) in the top ten, look down a bit further Only 80 countries are evaluated in the index making it no surprise that emerging economies of Kenya, Nigeria and Bangladesh occupy the spots on the bottom of the list. The big loser in the list, other than the US and UK, is the Euro Zone. The top ten is littered with small European nations that are all not a part of the Euro Zone. The Netherlands acts as the sole outlier of the group. Scoring is determined by looking a life satisfaction surveys taken by Gallup and a series of measured well-being indicators such as life expectancy, GDP per head, divorce rates, rate of corruption and gender equality. The data showed that, "GDP per head alone explains some two thirds of the inter-country variation in life satisfaction." As with any index, there are places to raised questions. Quality of family life is measured by divorce rates which is unable to capture unstable living situations where the parents remain together. Gender equality is determined by the number of parliamentary seats held by women, which can be skewed by countries that have mandatory limits. Such measures are rather hard to adequately quantify, so the Economist Intelligence Unit does deserve some slack in trying to create the index. The short article from The Economist that introduces the list also includes a picture of the the 1988 article and index. The United States sat high at the top alongside other European countries like France and Italy. The Economist calls itself out on the differences between the two lists by pointing out how the index indicators can impact the overall scores. It makes a cased for the less dynamic economies that site at the top of the list writing, "In the film “The Third Man”, Orson Welles’s character, the rogue Harry Lime, famously says that Italy for 30 years had war, terror and murder under the Borgias but in that time produced Michelangelo, Leonardo da Vinci and the Renaissance; Switzerland had 500 years of peace and democracy—and produced the cuckoo clock. However, there is surely a lot to be said for boring stability in today’s (and no doubt tomorrow’s) uncertain times." Cato's 5 most economically free countries (Hong Kong, Singapore, New Zealand, Switzerland and Austria) are all in the top ten of the Economist's index. However, Mauritus and Bahrain, two nations considered to have high economic freedoms, do not make the list for The Econmist. Also, Norway (3) and Sweden (4), are ranked 25 and 30 by the Cato Institute. There appears to be some level of correlation between economic freedom and the best place to live, but it is not perfectly aligned based on a quick comparison of each index. Developing economies are largely not included in The Economist's index, so it becomes a bit harder to make a comparison from the angle of development. Kenya is just ahead of Nigeria on the Economist Index for the last spot, but is well ahead in the Cato index coming in at 78th as compared to Nigeria at 120. That variance may be due in some part to the fact that more countries are evaluated by Cato's index. A lack of data makes it hard to then draw any conclusions in regards to development policies.